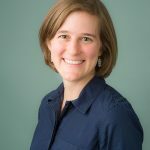 Andi has been with Oregon Reproductive Medicine since 2009 and her work has connected with the Egg Donor Program in various ways including, matching coordination, and management. Are you an egg donor? A donor candidate? There is so much to tell you about donation at Oregon Reproductive Medicine (ORM). We spend our time talking through instructions to keep you safe and promote a happy outcome for all. But often, our conversations end at the retrieval. Your eggs go out there, you rest, call with the next period, and we give you our warmest gratitude for your time and effort. Did you ever wonder what happens next? It’s incredible! On egg collection day we use a special kind of ultrasound wand with a needle attached. The needle goes in through the side of the vaginal wall, into the ovary, and then into each follicle. The egg is floating freely in the follicle’s fluid and suctioned out through the needle and into a tube. The tube can hold the fluid from one or two follicles before filling. Then, the tube is disconnected and passed through a window to the embryology laboratory. 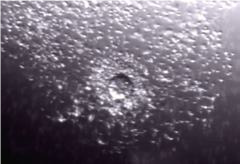 The embryologist will look at the fluid under a microscope to search for the egg. Conventional in vitro fertilization (IVF): the sperm is placed in the dish with the eggs and kept in an incubator overnight. The sperm swims toward each egg and one winning swimmer will fertilize the egg. 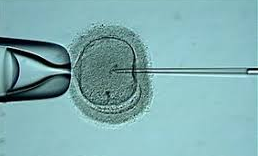 Intracytoplasmic sperm injection (ICSI): one sperm is selected by the embryologist and injected gently into the egg. The egg and sperm are kept together in a dish in the incubator overnight. For either fertilization option, the dish is checked the next day to see whether the egg is fertilized to become an embryo. In the image of the fertilized egg, one of the round circles in the center is the genetic material from the egg provider and the other is from the sperm provider. Fertilization depends on the quality of the egg, the quality of the sperm, and the conditions in the laboratory. Embryos are sensitive to smells and so the interior of the lab is built from low VOC materials and has a reverse air flow system to keep out scents from the rest of the building or outside. Once the embryologist confirms fertilization under the microscope, the embryos go back in the incubator to grow over a period of five more days. They are untouched during this time so the early development process is not disturbed. On Day 5 or 6, the embryos reach what is called the blastocyst stage. Blasts are more stable and more successful than earlier stage embryos. 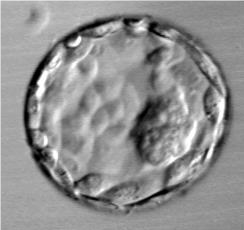 In the image of the blast, the dense clump of cells toward the right edge will make the baby if this embryo is successful. Any normal embryo that is fully developed to blast by Day 5 or 6 can be transferred to the recipient woman or frozen (cryopreserved) for the future. Most of the patients at our clinic opt for pre-implantation genetic testing, where we remove a few cells from what will become the placenta, to test for chromosomal abnormalities. This testing can help improve pregnancy success rates because a chromosomally abnormal embryo may look normal, but is likely to miscarry or not implant at all. When the test results are in and the recipient family is ready, one or two of the normal embryos may be transferred for a pregnancy attempt. The transfer may be to the intended parent or the recipient family may use the help of a gestational carrier (surrogate) as part of their fertility journey. Many transfers at ORM are successful on the first attempt because donor eggs are usually of high quality and we have a strong embryology and medical team. Egg donors can check with ORM at any time to learn whether your donation resulted in an on-going pregnancy. We will let our egg donors know the total number of pregnancies and the total number of births from their donation(s). If the original recipient family has remaining embryos and their family building goals are met, they may opt to donate the remaining embryos to other families who wish to become pregnant. We have an in-house embryo donation program where most donated embryos will go. The pregnancy and birth information we provide donors includes all the families who received embryos developed with their eggs at our clinic. We encourage our egg donors to check in regularly over the years as the transfers can occur much later than their initial donation. Some donors do not wish to know the outcomes. We will only notify donors if they wish to know outcomes. In a few rare cases, there may be a complication with a pregnancy or a child born from an egg donation. When this occurs, we might need to ask the egg donor for additional information or testing for the health of the child. We also ask that our egg donors keep us updated on new health information for themselves or their family members so our genetics team can help pass the information on to the recipient families. Learn more about becoming an ORM Egg Donor.